Mg-Li system alloys have poor corrosion properties, especially cold-rolled sheet leads to exfoliation corrosion as a result of long-term immersion test. 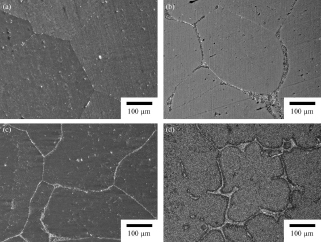 Addition of aluminum element to Mg-14 mass% Li alloy could be suppressed the occurrence of exfoliation corrosion. However, excess addition of aluminum to Mg-14 mass% Li alloy causes the degradation of corrosion resistance. In this study, the composition of aluminum in Mg-14 mass% Li was optimized to improve the corrosion property. 3 mass% of Al addition could be suppressed the corrosion rate because enough aluminum element dissolved into matrix and precipitation of the second phase was inhibited.